The last decades have revealed many new species that have been morphologically "hidden" in species complexes. Fortunately, the development in DNA sequencing and species delimitation modeling has made it easier for taxonomist to find and describe similar-looking, yet evolutionary distinct species. In a recent article, Robert Bryson Jr. and co-workers have described two new species in the enigmatic genus Kovarikia Soleglad, Fet & Graham, 2014 (Vaejovidae) that are endemic to California, USA. The article has an identification key for the genus Kovarikia. Morphologically conserved taxa such as scorpions represent a challenge to delimit. 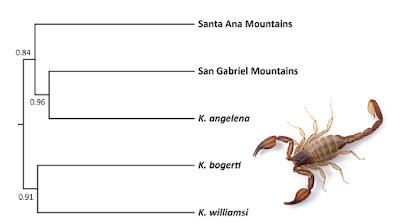 We recently discovered populations of scorpions in the genus Kovarikia Soleglad, Fet & Graham, 2014 on two isolated mountain ranges in southern California. We generated genome-wide single nucleotide polymorphism data and used Bayes factors species delimitation to compare alternative species delimitation scenarios which variously placed scorpions from the two localities with geographically adjacent species or into separate lineages. We also estimated a time-calibrated phylogeny of Kovarikia and examined and compared the morphology of preserved specimens from across its distribution. Genetic results strongly support the distinction of two new lineages, which we describe and name here. Morphology among the species of Kovarikia was relatively conserved, despite deep genetic divergences, consistent with recent studies of stenotopic scorpions with limited vagility. Phylogeographic structure discovered in several previously described species also suggests additional cryptic species are probably present in the genus.